In 1988, Congress established the Mississippi National River and Recreation Area (MNRRA) as a unit of the National Park Service, beginning at Dayton and Ramsey on the north and following the Mississippi for 72 miles, ending below Hastings and including the first four miles of the Minnesota River Valley. You can visit MNRRAs new Mississippi River Visitor Center in the Science Museum of Minnesota in downtown St. Paul. This article first appeared in the March-April 2004 issue of Big River magazine, 1-800-303-8201. Copyright 2004, Open River Press, Inc.
John O. Anfinson is a historian with the Mississippi National River and Recreational Area and author of The River We Have Wrought, A History of the Upper Mississippi (University of Minnesota Press). After landing in St. Paul on June 8, 1854, many of the Grand Excursionists grabbed every thing in the shape of horse-flesh, coaches, stages, wagons, &c. and headed for St. Anthony Falls. But why didnt they continue by steamboat to the falls? They didnt because the Mississippi changes dramatically six miles above St. Paul (2004 pop. 287,151) where the Minnesota River joins it. At the confluence, the floodplain of the Mississippi gives way to what is known as the gorge. About eight and a half miles long, the gorge is the only stretch of the river that drops so deeply into such a tight canyon. During high water, before the locks and dams were built, a fast and turbulent rapids boiled through the gorge, jumping and twisting over the boulders left by the retreat of St. Anthony Falls. During low water you could have waded across. Whether high or low, navigation ranged from treacherous to impossible. The first U.S.-government representative to ascend the gorge, Lt. Zebulon Pike, arrived at the foot of St. Anthony Falls on September 26, 1805, after, he complained, much labor in passing through the rapids. From the Minnesota River to St. Anthony, he wrote, there is almost one continued rapid, aggravated by the interruption of 12 small islands. Few pilots would risk their boats running the gauntlet of the gorge. So St. Paul had become the head of navigation, explaining why the excursionists departed overland to visit the falls. After seeing the falls, some continued down the rivers west bank, taking in Minnehaha Falls and Fort Snelling. Others returned to St. Paul, joined those who had stayed there and boarded the five steamboats, which paddled up to the fort. 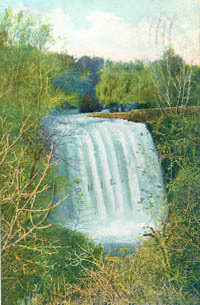 Minnehaha Falls graces a 1907 postcard. About a mile and a half upriver from Ft. Snelling, Minnehaha Falls tumbles over a 53-foot cliff. Only a year after the Grand Excursionists had departed, Longfellow published The Song of Hiawatha, immortalizing the falls. Now a part of the Minneapolis Park system, it is one of the few places the excursionists saw that might still look much like it did in 1854. The Dakota called the confluence of the Mississippi and Minnesota rivers Bdote. In 1851, the Dakota Friend, a newspaper printed by missionaries Samuel and Gideon Pond, reported that one of the great natural facts: is that the mouth of the Minnesota River lies immediately over the center of the earth and under the center of the heavens. The settlers and fur traders changed Bdote to Mendota (2004 pop. 197), which became the name of the settlement across the Minnesota River from Ft. Snelling. On September 22, 1805, Pike began negotiating with seven Dakota chiefs at Pike Island for Dakota lands to build forts at the mouths of the St. Croix and Minnesota rivers. Although only two Dakota leaders signed, Little Crow and Le Fils de Pinchow, the Dakota gave up some 100,000 acres for which the Senate initially agreed to pay only $2,000. In August 1819, Colonel Henry Leavenworth arrived at the confluence of the Minnesota and Mississippi rivers to begin building a new fort. During the winter of 1819-1820, he set up Cantonment New Hope in the floodplain below Mendota, where scurvy killed between 40 and 70 soldiers. In the spring of 1820, the troops moved about a mile up the Mississippi to a place they called Camp Coldwater. In August 1820 Colonel Josiah Snelling replaced Leavenworth, and on September 10 Snelling set the forts cornerstone. After visiting the nearly completed fort in 1824, Major General Winfield Scott recommended changing the forts name from Fort St. Anthony to Fort Snelling. Today the fort is a National Historic Landmark. High above the confluence, on Pilot Knob, the Dakota signed the Treaty of Mendota, in 1851, giving up their lands west of the Mississippi River in the Twin Cities area for reservations well up the Minnesota River. Eleven years later, the government imprisoned some 1,700 Dakota men, women and children in the bottomlands below Fort Snelling after the 1862 Dakota Conflict. Lock and Dam 1, with its battleship-like control center, definitely belongs in the late 20th century. Congress authorized two of the first three locks and dams on the Mississippi River to overcome the rapids of the gorge. In 1907, the Corps of Engineers completed the Meeker Island Lock and Dam (the first on the Mississippi) and had nearly completed the lock at Lock and Dam 1. Both were to be low dams. But hydroelectric power came of age in America during the early 20th century and residents decided to build only one high dam in the gorge. In 1910, Congress accepted their arguments and revamped the project to make Lock and Dam 1 the high dam. The Corps destroyed the top five feet of the Meeker dam, took off the lock gates and walked away, but the ruins are still visible at low water. In 1917 the Corps completed Lock and Dam 1, and in 1924 the Ford Motor Company completed its hydroelectric powerplant at the dam. Ford still operates the plant and uses the electricity to make Ford trucks on the bluff above. The Grand Excursionists reached the falls in time to enjoy St. Anthonys natural glory. Hennepin Island divided the falls in two. By the Treaty of 1837, the eastern half had been opened to development, and in 1848, Franklin Steele had completed the first dam and sawmill here. From 1849 to 1852 the number of sawmills increased from one to four, and daily lumber production grew from 15,000 to 50,000 board feet. The west side remained natural, impressing the excursionists. The United States acquired the land on the west side in the Treaty of 1851, but had not yet opened it to settlement. Nevertheless, by 1854 some 300 squatters had moved onto it. Congress officially opened the west side to settlement and hydropower development in 1855. Although Excursionists had recently seen Niagara Falls, they praised St. Anthony for possessing a different kind of beauty. They also speculated that it would become an industrial workhorse, exceeding Lowell, Massachusetts. They were right. From 1880 to 1930, Minneapolis would lead the nation and, at times the world, in flour production. Minneapolis, however, wanted more. While Lock and Dam 1 opened navigation to the falls, the steep walls of the gorge provided little space for terminals, warehouses or rail connections. Boosters in Minneapolis (pop. 382,618) recognized as early as the mid-19th century that they would need two locks and dams to get traffic above the falls, where another Mississippi River  the prairie river  began. Here low banks framed the Mississippi on either side, and businesses could easily build up to the rivers edge. In 1956 the Corps finished the Lower St. Anthony Falls Lock and Dam and in 1963 completed Upper St. Anthony Falls Lock and Dam. Upper St. Anthony lock has a lift of 49.2 feet, making it the highest on the river. In the 10 miles from above the falls to Fort Snelling the combined drop through the three locks and dams is over 111 feet. John O. Anfinson is a historian with the MNRRA and author of The River We Have Wrought, A History of the Upper Mississippi (University of Minnesota Press).